Romantic Flowers & Gifts can be given at any time. You don't need a special occasion to be romantic, however for anniversaries, birthdays or just because we have a wide selection of flowers and gifts perfect to show your partner your Romantic side and put a smile on their faces. Aberdeen Flowers have a wide selection of flowers which are perfect for romance. Our expert florists in Aberdeen beautifully arrange your flowers and will deliver them personally in Aberdeen and the North East of Scotland. We can also deliver throughout the UK with our network of florists. We have various flowers to symbolise romance and especially Roses. Our florists in Aberdeen can make up beautiful hand tied bouquets with roses which are just perfect to give to your loved one at any time of the year. 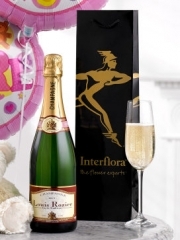 Aberdeen Flowers also has a large selection of Champagne and Wines and we can also include chocolates as well. These optional gifts can be delivered by Aberdeen Flowers with your bouquets and arrangements or even on their own. Aberdeen Florists love providing you with flowers and gifts because customer satisfaction is our first priority at all times. All the flowers we use are up to the highest standards because everything is imported directly to Aberdeen Flowers from Holland so that we know that quality will be guaranteed in every arrangement you order. Importing our flowers is the best way to ensure quality and freshness for your Aberdeen Flowers so that they will be gorgeous and last as long as possible for you to enjoy. Your romantic flowers will be given the care and attention they deserve by our Aberdeen Florists who are highly skilled and know exactly what you want out of your romantic flower arrangements. 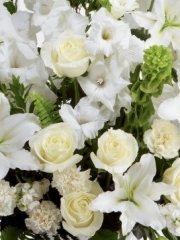 Our Aberdeen Flowers drivers make sure that your gifts and flowers are delivered carefully so that they will arrive in perfect condition at the address you specify so that we can do everything you need and you need not trouble yourself once you have placed your order for romantic flowers with our Aberdeen Florists. Aberdeen Flowers even offer same day delivery when your order is placed before 3pm. We can ensure that your flowers are delivered anywhere in the country and even abroad in 140 other countries worldwide so that you can have flowers delivered wherever your loved one finds themselves. If what you want is not available on our website you can speak to one of the Aberdeen Florists to place a bespoke order wherein we will make up an arrangement with all the details you specify. You are able to choose the sizes, varieties and colours that go into your bespoke arrangements from Aberdeen Flowers so that you know your recipient will love whatever they are about to receive. Amongst our wide selection of flowers you are sure to find something that will be perfect for your loved one so that you can really give them something special that includes their favourite flowers or maybe just something more unique than the typical romantic flower arrangements. Our Aberdeen Florists will be delighted to take up whatever order you would like to make because we love creating beautiful things for our customers since flowers are our passion. When you order from Aberdeen Flowers you should know that you are putting your trust in the right people because we are always willing to do whatever you need from us to provide exactly the flowers you require for any occasion. This is the reason why Aberdeen Florists should be your first choice when it comes to flower arrangements and bouquets, whatever your reason for sending flowers.